Yogis measure a person’s age by the flexibility of the spine. As we age, the venous supply to the spinal disks begins to diminish. Through yogic exercises that bend and stretch the spine, fresh blood and nerve flow revitalize all the major glands and organs. Unlike other forms of exercise, which develop fitness by stressing the body, yoga builds strength and endurance while lowering the stress hormones that age us. Jim Thorne is one of my most inspired and consistent yoga students, whose practice has the sheen of a long-term committed love affair. He has an insatiable curiosity and drive to experiment and deepen his practice. He inspires with his beautiful poses and gravity-defying headstands! At 68 years old, he is also a prime example of yoga’s multi-faceted benefits. When we sat down for an interview he had just completed the Bolder Boulder 10K along with his daughter and granddaughter, and 50,000-plus other entrants. Take The Magic Step™: Did yoga help you in the race you just completed? Jim Thorne: Without a doubt. I found myself observing the other runners – their posture, foot placement and tension in their bodies. It reminded me to stay loose, keep my chest open, my spine extended and to breathe mindfully. I was in my early 40s, living and working with my family in Boulder, Colorado. There was a class offered at the University of Colorado recreation center. That was over 25 years ago – yoga was still a fringe activity for many. What inspired you to take a yoga class? I thought it sounded mysterious; I thought I might learn secrets [laughs]. After a few classes, I became even more intrigued by the esoteric aspects of yoga. And then, increasingly curious about how it was making my body and mind feel. Some of it was excruciating, just in that I had never moved my body that way! And I wasn’t used to being patient – all that “slow down, listen to your body and breathe” stuff was unfamiliar. I was used to being really hard on myself when working out. In fact, my workouts were abominable – I’m so glad I got into yoga because I was destroying my joints. Initially, it was very aerobic because I struggled though the poses. I couldn’t straighten my legs and stretch the way some students did. Over time I learned that I didn’t have to work so hard, or match anyone else’s practice. I learned to go inside myself and calm down. I began to use my breath to become more expansive – lifting and extending the body – it was a great discovery! Breath helps in the utility of the pose – it feels more alive because I’m not in my brain, I’m in the rest of me. Make sense? Absolutely. What other sports do you currently participate in? I run [paddle] two to three rivers a year, and my wife and I go hiking every summer in Alaska. I also attend weekly spinning and weight-training classes, and I swim with an all-ages group at the University of Colorado rec center. I move along as well as the kids and I attribute that to yoga! Sounds like yoga helps with these activities. How? I couldn’t live without yoga practice. Yoga puts your joints through their full range of motion without pain. It helps with my flexibility; I’m stronger and I breathe better. Yoga has also taught me proper alignment and strengthened my core so I’m much less prone to injure myself in other endeavors. Yoga has increased my awareness of my skeletal frame and how it reacts with my muscular self. What do you like most about yoga? It’s nice…it’s a precise practice for living and a respite from the real world. I can concentrate and let down my guard in a safe environment. It’s on the mat that I’ve developed the ability to center and balance myself, mostly though yogic breath. Has it changed for you over the years? Yes, it continues to deepen. What has been your motivation to stick with yoga? I found a certain dogged determination to stay with yoga when nothing about it was easy, yet it still felt great when I was done. I appreciated the challenge and somewhere inside, knew this would be good for me. Initially I struggled with holding poses and it was not comfortable! For example, because of my tight shoulders Downward Dog was really tough for me for the first five years. But, I observed that the teachers and other students could get into positions without so much effort – I wanted to get to that stage. Of course, there are always some poses that are out of my reach, but the feeling of accomplishment when you achieve new territory keeps me excited. Find a teacher you resonate with. Stick with your practice – it gets easier and deeper as you progress and discover more. Eventually things will come. The real work starts now as you begin to learn how to hold the shape of the pose. This takes consistency; otherwise, the shape of the pose may escape you. Remember my tight shoulders? Well, they may have hurt in Downward Dog, but if I hadn’t opened them up with yoga then I’d be in trouble now. Don’t be discouraged, the benefits are so tremendous! What would you say is the weekly minimum needed to make some progress? I tell my students a minimum of three times a week to maintain their new-found flexibility. That’s a good schedule. If you really want to accelerate your practice, I recommend four classes a week with a teacher you like, and then do two more practices at home. Set up a little space in your home and go over what you learned in class. Sometimes, I’ll just do restful poses, breath work or poses that my body really needs, like things that flex my knees. They’ve come a long way. If you’ve missed yoga for a while, what are some good poses to get back into it? Downward Dog is one of the best – it lengthens the hamstrings, spine and neck, and opens the shoulders and back. Cat/cow is also good, as are the Warrior poses and Triangle For the more advanced would be shoulder stand with props (unless your neck feels flexible), and headstands. If I want to take a 5- to 15-minute lunch break, what poses would be best to counteract sitting all morning and clear my mind for the afternoon? You want to do poses that open the chest and give an arch to the spine. Passive backbends are good, like bridge pose with a block or on a blanket. You can also lie on a blanket roll placed horizontally under the sacrum, or low or mid back, making sure the shoulders stay on the mat for maximum chest opening. Roll around on the floor holding on to the knees. Twists invigorate the spine, and a good Warrior 2 can put the fire back in your day. 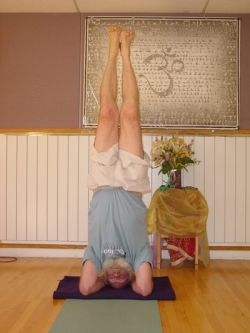 There is nothing like inversions to clear the head – Downward Dog, Plow and Shoulder Stand are good or, if more advanced, do headstands or handstands. How can I tell if I’m progressing in my yoga practice? It’s so much easier to stick with an activity when you get positive feedback. You’ll notice progress on many levels: deeper, more controlled breath; increased strength and flexibility; better posture and alignment; extension of the spine. Essentially, yoga becomes more fun as it becomes more familiar – your body knows where to go. Over time, you’ll find there’s a lightness and joy in the poses. What is yoga’s role in your future? I couldn’t live without yoga. The practice is an ongoing, inward journey, and I’m on the surface. Even after 20 years there’s so much elation when I get that ”aha” moment in a pose that signifies I’ve discovered a new level. In truth, everything is yoga – whether we’re on a mat focused on our breath and balance, or out on the street. It’s all a conscious mindfulness in how we participate in life. Introducing a yoga practice into our lifelong routine will bring innumerable benefits, as Jim can attest to. Even if we practice just a few minutes each day, the intention and commitment to better mind and body health is there. This commitment is a thread that will run through our lives, strengthening us and ultimately benefiting those around us. *This pose is an advanced posture requiring substantial training and experience. Take The Magic Step suggests that it be learned and practiced only with the guidance of a qualified instructor. It is included here within the context of a relevant editorial topic.